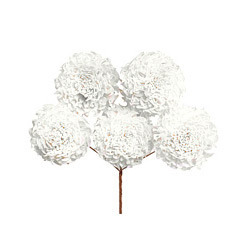 With the endorsement of our experienced professionals, we are engaged in offering a wide assortment of White Shola Flowers to our valuable clients. The products offered by us are processed using advanced processing techniques in compliance with the prevailing market trends. Our offered range is highly appreciated by our clients for their attractive look and durability. Apart from this, these are processed in accordance with the universally accepted norms of quality to furnish maximum satisfaction to our clients.